I wrote a story on flowering plants and trees at Gran Canaria here on Enjoy Food & Travel last week. I did some research and managed to identify most of the species I had seen, except this magnificent blue flower and two more plants. My good knowledgeable friend Dagfinn Skoglund wrote me to tell that the beautiful flower climbing on a wall at Puerto de Mogán was a Thunbergia grandiflora. This is what I love in the process of creating stories on Enjoy Food & Travel. The everlasting learning process. 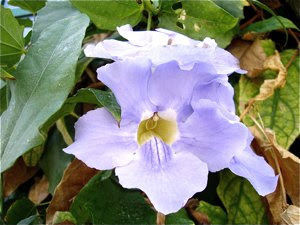 The Thunbergia grandiflora is named after the famous Swedish botanist Carl Peter Thunberg that lived from 1743 to 1828. The Thunbergias (as there are many subspecies) originates from the tropical areas of Madagascar, Southern Africa and Southern Asia and may be vines or shrubs growing up to 8 metres tall, as the one climbing on the bright white building at Puerto de Mogán. They may be too vigerous for certain regions they are introduced to and where they do not have any natural enemies, as Australia where certain Thunbergia species are regarded as invasive. That is certainly a thing to consider for those of you that may import seeds to plant where you live. Another mystery solved and more to learn!